Are you a non-knitter looking for gifts? Look no farther! It can be difficult for a non-knitter to pick a gift for a knitter. Heck, sometimes it can be tricky for another knitter! But here are some sure-fire gifts for knitters of any skill level. This clever little gadget is something no knitter should be without. The main task of a ball winder is to take a skein of yarn and turn it into a lovely knittable center-pull ball But they are also incredibly handy for ripping back your knitting - something that every knitter has to do eventually. They can also be used to separate a single skein of sock yarn into two balls, which is great for toe-up sock knitters. A yarn swift can be a beautiful hand-turned piece of woodcraft costing several hundred dollars. Or you can buy one of the wire-and-plastic ones that clamp onto the side of a table. 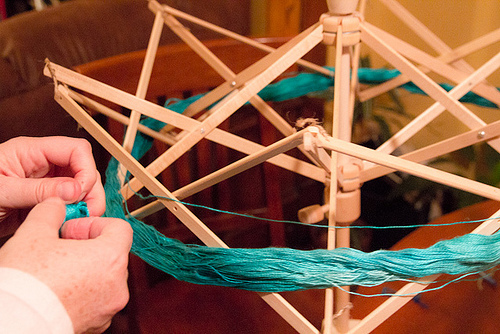 In either case, it is an invaluable tool for working with skeins of yarn. You can put the skein on the swift and then wind it off into a ball. You can also take loose yarn and skein it up by twirling the swift. If your knitter doesn't have a Denise kit, then they surely want one! Even if it doesn't become their primary knitting needle set, it is really helpful to know that no matter what size needle you need from #5 to #15, you have one at hand. On the "stocking stuffer" end of the gift scale, any measuring device is always welcome. Yarn stores sell special rulers that also help you calculate your gauge, and have holes so that you can tell what size needle you have. These are great! But regular tape measures are also handy, particularly the fabric kind that are used by seamstresses. Seriously, no knitter can have too many of these. Look for them hanging on pegboard near the counter of the yarn store, or ask an employee to help you pick some out. Get an assortment of different sizes and shapes. You can't go wrong!